In this October 11, 2017, file photo, a police car patrols a darkened street in Aibonito, Puerto Rico, three weeks after Hurricane Maria hit the island. The island is reporting power outages due to the remnants of Hurricane Beryl on Monday, July 9, 2018. Puerto Rico and the Virgin Islands braced for heavy rains and strong winds Monday as remnants of the new season's first hurricane provided an initial test of how far they've recovered from last year's devastating storms. 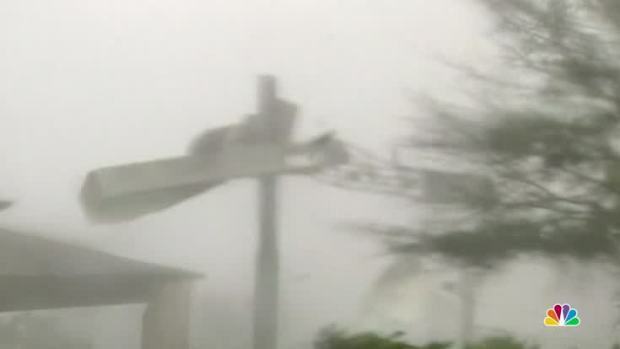 Tropical Storm Beryl disintegrated after rushing over Dominica and into the eastern Caribbean, but the U.S. National Hurricane Center said the remnants still could bring 2 to 3 inches (5 to 8 centimeters) of rain pounding down on homes in Puerto Rico still damaged by September's Hurricane Maria. Forecasters said this could unleash flooding and landslides in Puerto Rico and the U.S. Virgin Islands. 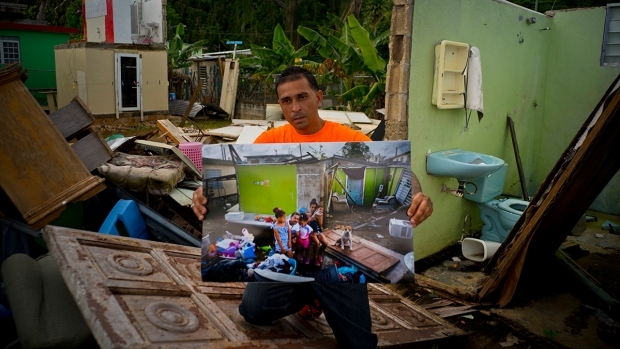 Nine months after Hurricane Maria, some Puerto Rican communities enter enter the new hurricane season without power and dealing with water shortages. 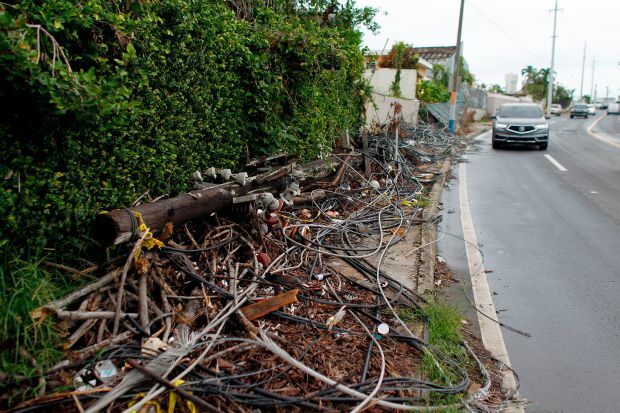 The Category 5 hurricane caused more than an estimated $100 billion in damage, killed dozens of people by the most conservative estimates and destroyed up to 75 percent of Puerto Rico's electricity transmission lines. The National Weather Service issued an alert warning that heavy showers and winds of more than 50 mph (80 kph) were approaching Puerto Rico's east coast Monday morning. The storm's center was expected to pass just south of the island. The U.S. Virgin Islands, meanwhile, announced that schools and government offices would be closed in St. Croix. Beryl, which had been the Atlantic season's first hurricane, was losing tropical storm status late Sunday when it crossed Dominica, another island that had been battered by Hurricane Maria, which hit as a Category 5 storm and killed dozens of people. Marshall Alexander, with Dominica's Meteorological Service, told The Associated Press that no landslides or widespread flooding have been reported. A curfew also has been lifted. "Definitely, we were spared the worst," he said. The storm was expected to pass just south of Puerto Rico, which could see sustained winds of 15 to 25 mph (25 to 40 kph) and gusts of up to 50 mph (80 kph), forecasters said. It also dumped torrential rain in the U.S. Virgin Island of St. Croix, with the National Weather Service warning of high winds and fallen trees and light posts. Memories of Hurricane Maria haunted many along Puerto Rico's southeast coast, where La Favorita grocery store in Humacao had been swamped in 5 feet of saltwater, mud and seaweed. On Monday, people were still buying water, batteries, candles and food there as the storm neared. Delia Ayala, a 57-year-old retired government secretary, walked out with three cartons of milk. "I'm scared that there could be a lot of rain," she said, adding that Maria flooded her home. "We fear any little rain and any little wind." Flooding is a big concern for those still living in homes that have not been fully rebuilt since Maria. Lourdes De Jesus, who traveled from West Springfield, Massachusetts, to help repair her mother's house in southeast Yabucoa, said the roof consists of tarp and recycled zinc and leaks even during a light storm. "I don't know what we're going to do," she said. "We don't have the money to spend on zinc roofing." Meanwhile, Tropical Storm Chris was squatting on Monday about 215 miles (345 kilometers) off the coast of the Carolinas. Forecasters expect it will gain hurricane strength before moving up Gulfstream waters on a path that could cause life-threatening surf on East Coast beaches this week. Chris had top winds of 60 mph (95 kph) Monday morning, and was expected to remain nearly stationary through Tuesday before moving northeastward as a hurricane. It was far enough out to sea that no coastal watches or warnings were in effect, even for the closest point of land, Cape Hatteras, North Carolina.